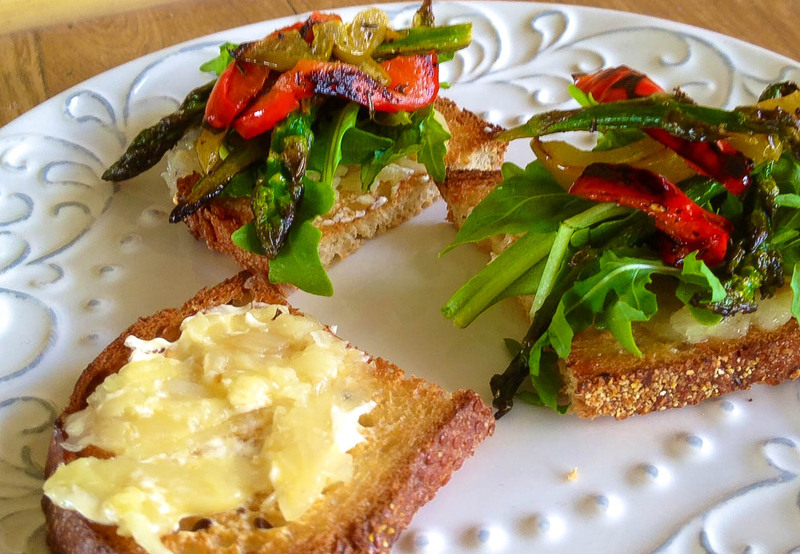 Looking for a light yet tasty appetizer? This is perfect. It packs a nice garlic flavor, with hints of lemon, cayenne, basil, and arugula. 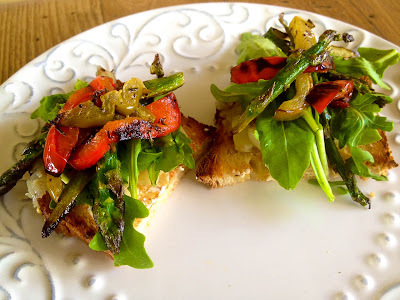 The asparagus and bell peppers are lovely toppings, and they bring a lot of color to the dish. 1. Preheat your oven to 400 degrees. Wrap the garlic, a dash of salt, and 1 1/2 tablespoons of the olive oil/vegan margarine in aluminum foil. 2. Once the oven has preheated, place the wrapped garlic in the oven, and roast for 15 to 20 minutes. The garlic will be tender when it's ready. 3. While the garlic is roasting, add the asparagus, bell peppers, remaining olive oil/vegan margarine, lemon juice, salt, cayenne, basil, and onion powder to a large skillet. Toss to coat, and cook on medium heat for about 5 minutes. 4. Turn the heat up to medium-high and continue cooking for another 5 minutes or so (until the veggies are a little charred). 5. Once the garlic is ready, pull it out of the oven, and mash it in a small bowl. 6. Toast the bread. Once the bread is ready, spread the mashed garlic mixture over each piece, and top it with the arugula, and then the veggie mixture. Mmmm, these are chock full of yummy ingredients! I LOVE roasted garlic. I'm not very familiar with aragula, but now it has me intrigued! Crostini are one of my favorite warm weather foods! Loving all of the fresh flavor you packed onto these!